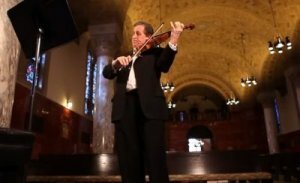 Some of you may remember the story from a few years ago about the violinist who played the violin during his own brain surgery. It’s a powerful statement about the impact of medical professionals and musicians working together in creative ways to address the specific medical problems that musicians face. The story has recently been in the news again, as the Mayo Clinic has publicized it as part of its 150th anniversary celebration. Thanks to former student Lindsay Warrenburg for alerting me to the resurgence of this remarkable story. played for 40 years. In 2009 he was diagnosed with essential tremor (ET), a disorder of the nervous system that causes a rhythmic shaking – most often in the hands, but it can also affect the head (as with Katherine Hepburn), vocal folds, arms, or legs. It is not dangerous or life threatening, but it can be quite severe in some people, so that simple tasks like writing a check or eating soup become very difficult. And for a musician, especially a string player, essential tremor can be a career-ender. The usual first course of treatment for essential tremor (ET) is propranolol or primidone, but those medications work for tremor only about 50% of the time. I don’t know if Frisch tried those medications but eventually, doctors at the Mayo Clinic in Rochester, Minnesota convinced him to try DBS, deep brain stimulation, a neurosurgical procedure that uses a surgically implanted device like a pacemaker to deliver electrical impulses to specific areas of the brain that control movement – blocking the abnormal signals that are causing the tremor. The Mayo Clinic bought a violin and bow that their engineers modified so that Frisch’s movements could be monitored during the brain surgery (not taking any chances on using his own 1772 Balestrieri in the operating room ). 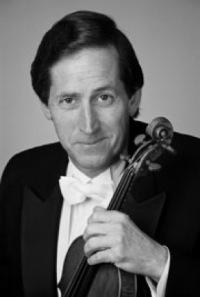 Frisch played the violin as the surgery was proceeding, the surgeons monitoring the tremor in his brain as he played. The video below of the surgery was uploaded to You Tube by the Mayo Clinic. Music medicine is a relatively new field, unlike sports medicine, which has been around a lot longer. But music medicine is a growing field, and stories like this one remind us that sometimes a malady that is just a nuisance for most people can be crippling for a musician. So it is important for medical professionals to have a broadened understanding of the medical issues that a musician may face. In the world of music and music medicine, we rarely hear about essential tremor, although an estimated 10 million Americans suffer from ET, so clearly a lot of musicians have it, and it may have ended a lot of careers. ET is the most common movement disorder, followed by Parkinson’s and then focal dystonia. Dystonia, which affects about 1% of musicians, has been studied a great deal and there are hundreds of papers in research journals about musicians’ dystonias. Dystonias are intermittent muscle contractions that cause abnormal, often repetitive movements. In musicians, dystonias can affect the fingers in violinists, guitarists, and pianists (Leon Fleisher and Gary Graffman), or the embouchure in wind and brass players. Trombonist David Vining has an excellent website that relates his recovery from embouchure dystonia. But there has been practically no research on essential tremor in musicians, so it is wonderful to know that Roger Frisch’s story is becoming more widely-known, and to be reminded that essential tremor doesn’t have to be a career-ender for a musician. This entry was posted in Medical problems of musicians and tagged deep brain stimulation, essential tremor, movement disorders, music medicine on October 23, 2014 by Lois Svard. Good post, Lois! With very precise stereotactic procedures now available, more of this will occur, making very small lesions in appropriate parts of the brain to abolish such tremors. Patient awake, of course. Back in the 1950’s, the great Canadian neurosurgeon, Wilder Penfield, pioneered techniques for operating on awake patients in order to remove lesions causing seizures. Some of these curative lesions can be done now without opening the head – using finely collimated radiation focused to a fine point.